A yellow tomato to amaze you! GREENHOUSE CULTURE - To grow in heated greenhouses sow January onwards, in a temperature of 16-18°C (60-65°F). Transplant into small pots. 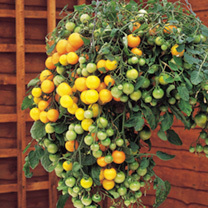 Plant out in large pots, growing bags, or into a soil border at 45cm (18") spacing. Pinch out side shoots regularly and when in flower tap or shake plants daily to aid setting. For growing in unheated greenhouses, sow in warmth, from March onwards. Plant late April-early May. Harvest mid August-mid October. OUTDOOR CULTURE: Sow in trays or pots indoors March-April and harden off the plants before planting 45cm (18") apart in early June. Choose a warm, sheltered position. Harvest mid August-mid October. Standard varieties: Support with stakes or canes. Pinch out the main growth when four good trusses have set. Bush varieties: These cease growing when 30-38cm (12-15") high. Dot not remove side shoots. Support is not essential, but short stakes will help control the plants and keep fruit clean. HEALTH BENEFITS: Packed with antioxidants including vitamins A (For growth, healthy hair, skin, bones, teeth and eyes as well as resistance to respiratory infections) & C (Anti-ageing, wound healing, decreasing blood cholesterol and prevention of infections. Assists the body in absorbing iron) and Lycopene. High in vitamin C they stimulate the bodies immune system. (ANTIOXIDANTS: Term used to describe a number of organic substances such as vitamins A, C & E, the mineral Selenium and 'Carotenoids' - the pigments which colour many fruits and vegetables. Antioxidants are thought to help prevent cancers, heart and stroke problems by assisting in the 'mopping up' and expulsion from the body of substances known as 'free radicals' which can be created by exposure to various environmental pollutants.) COOKING HINTS Try slow roasting for 1½-2 hours in olive oil with sea salt and black pepper. Scrumptious!